There is nothing better than having hearty Irish breakfast, getting out in the fresh air and walking through the beautiful countryside that surrounds you in County Kerry. Walking is one of the best ways to appreciate Kerry’s beautiful scenery. Discover the jagged coastline, rolling countryside, quiet forests, serene lakes and remote mountain valleys. 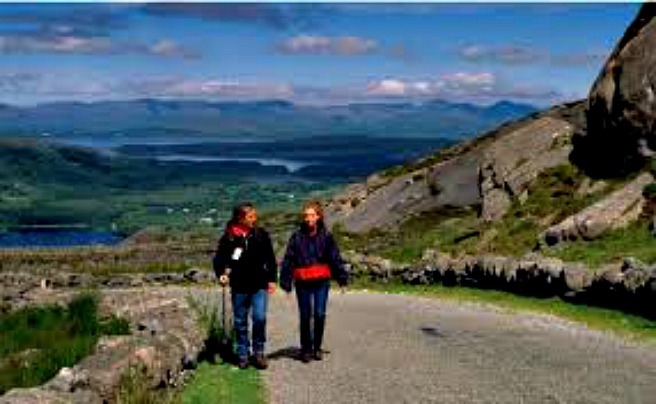 Over the last few years County Kerry`s walking trails have seen a steady increase in the number of overseas visitors choosing Kerry as a walking destination. A third of the visitors to Kerry stated that walking was an important factor in their choice of County Kerry as a holiday destination. There are now a large number of Way-marked Trails in the County ranging in distance from 25km to over 100km. Many of these trails can be enjoyed as day walks or can be walked in their entirety over a number of days. In recent years a growing number of shorter looped walks have been put in place linking into National Way-marked Trails. Choose from looped walks that last from one hour up to a day, and multi-day trails. If you are a more experienced Walker with map-reading and compass skills you can venture off-trail to explore County Kerry’s rugged mountain areas. Wherever you go, Remember, your safety is your own responsibility! Be prepared for Kerry’s changeable weather. It’s possible to experience sunshine, strong winds and heavy rain all in one afternoon. Nobody does rain like the Kerry Irish Rain. Other places have rain too, but the Kerry rain has character. • Decide what type of walk you want and how long you want to walk for. • Choose a walk that suits everybody in your group. • Print the downloadable map and put it inside plastic to keep it dry. • As there aren’t marked footpaths high on the Kerry hills you will need map-reading and compass skills to walk in these areas. • Ask locally for advice on where to walk and what kind of terrain to expect. • Be realistic; choose a route that matches the skills and ability for you or your group. • Check the weather forecast and think about how the weather will affect your walk. • Ensure you have enough time to complete the walk before darkness (allow 1hr per 3km, add 30 minutes for every 300m of ascent). If you plan to walk in the hills remember that the temperature will be lower there, the winds stronger and you are more likely to get rain. Mist is a serious problem; you can quickly lose all visibility, especially on coastal hills. Don’t forget that heat can also be an issue and that sunhats, sun cream, and water are important to prevent sunburn, heatstroke and dehydration. Once the rules are set, County Kerry walking trails are paradise with a number of peaceful and scenic walks, as well as the Kerry Way. But even if you do not take the long distance walk you can get a touch of the Kerry Way experience through taking any or both of the two new well marked Loop Walks which have been established recently in the Sneem area as part of the Kerry Way network. You are in a Walkers Paradise! The choice is yours – MacGillycuddy's Reeks, Irelands highest mountain, Mount Brandon, Ireland’s second highest mountain, the Conor Pass, Ireland’s highest mountain pass, to Ireland’s longest beach (12 miles long), stretching from Cloghane village to the tip of the Maharees. The Slieve Mish Mountains and Glanteenassig. There are many trails and most of the walks offer spectacular views over the lakes, bogs, rivers, waterfalls, mountains and bays and you will come across deserted villages and uninhabited valleys as you explore this unique County. So get your boots on and have a go at one or more of these glorious walks.